Pharmacological group: Combined expectorant mean of herbal origin. Aiding substances: аscorbic acid, magnesium based carbonate; polyvinylpyrrolidone, calcium or magnesium stearate, starch, talcum. Plants compounding in the preparation contains complex of biologically active substances: bitter glycoside (aucubin and etc.) flavonoids, tanning matters, carotene, ascorbic acid, poly and monosaccharides, mucous substances, saponin, alkaloid, coumarins. 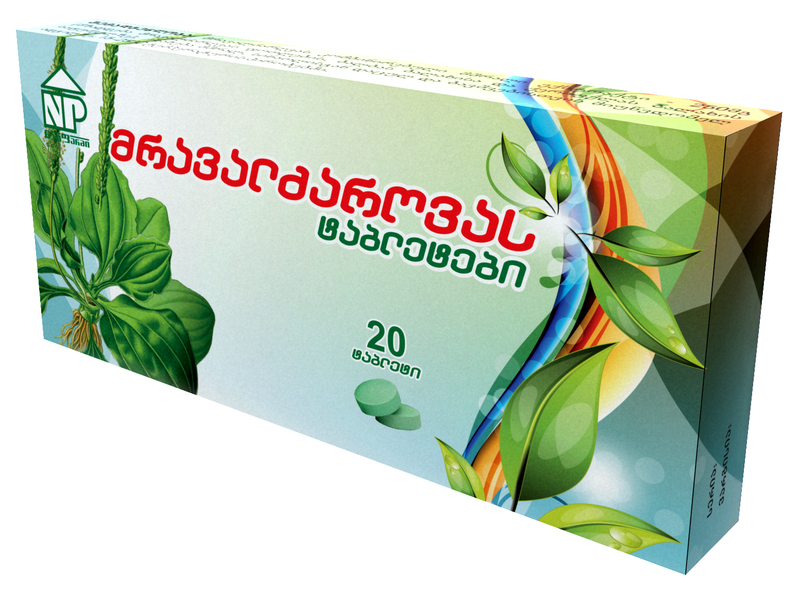 Plantago major has expectorant, antiinflamatory, softening action on the mucous membrane. Strengthens blinking epithelium lashes movement of the mucous membrane and bronchial slime secretion; liquefies phlegm and promotes its secretion. The syrup has tranquilizer, smooth muscle spasm removing, vessels widening, and light sedative operation. The sum of alkaloids existing in mullein with ganglion blocking and vessels widening action causes lowering of arterial pressure. Indications: Dry cough, coughing in smokers. Side effects: Allergic reactions: itch, rash, nettle-rash, swollen; From the side of digestion system: nausea, heartburn. Using rule and dosage: Taken perorally. For adults and for children above 12 years: 1 tablet 3-4 times a day before eating. Duration of treatment is determined by the doctor individually. In case of dose omission the next dose should be taken according to the initial scheme. Contra-indications: Additional sensitivity towards the components composing the preparation. Pregnancy and the period of lactation: Preparation can be used during pregnancy and lactation period by the doctor’s prescription. Influence on cars and other vehicles: The preparation does not influence on driving cars and other vehicles. Interaction with other preparations: It’s not recommended to use the preparation in combination with drugs that suppress the cough. It’s possible to use such combination with the following order: in the day time - expectorant drugs, in the evening - drugs that suppress the cough (for a complete sleep). Special instructions: The drug is not prescribed for children till 12 year of age. Treatment: Stop taking the preparation. Caution: The Preparation is carefully prescribed in the period of pregnancy and lactations. Primary packing: 10 tablets in blister. Secondary packing: 2 blisters are located in a cardboard box. Storage conditions: Store at 15-25º C, in a dark, dry place and keep away from children. Order of issue: III group of a pharmaceutical product - issued without prescription.